Fishing, like the weather, is heating up. The GOTL Open is hosting its Spring Bash fishing tournament in Oak Harbor next weekend. Registration deadline is today (April 5). 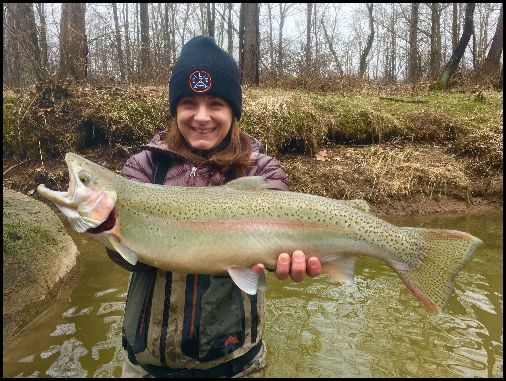 Last weekend, 140 anglers fished in the Rocky River in the sixth annual Barbie Rod Steelhead Derby. Corey Zelinkski won with a 26-inch fish, and the event raised nearly $8,000. The breakwall at East 55th and the rocks at Edgewater Park offer a chance at steelhead and yellow perch, Durkalec says. The harbor areas are a good place to find pre-spawn northern pike and largemouth bass (see phoros from Gordon Park this week below). A white spinnerbait with silver blades worked slowly is a good early season choice for both species. Here’s the full Ohio Department of Natural Resources fish report. Where: Open water fishing is upon us and anglers are doing well trolling near 1.0 mph. Stick baits in dark colors with short leads have been producing best. Many anglers are using snap weights approximately 20 feet back, with another 20 to 30 feet to the lure. Action has been the best near the Camp Perry firing range and Kelleys Island in 25 to 35 feet of water. The jig bite will begin to pick up in the coming weeks, but anglers occasionally are doing well vertical jigging blade baits and spoons where fish are being marked. Note: A Lake Erie fishing permit is required for nonresidents until April 30 for Lake Erie and areas immediately upstream in creeks, rivers, and tributaries.